Education: Informal, Cobbler, Surveyor, Lawyer. Honorary M.A. from Yale. Work: Admitted to Bar in New Milford Connecticut, 1754; Justice of the Peace, elected to General Assembly, representing New Milford Connecticut, 1755-58, 1760-61; Commisary for the Connecticut Troops, 1759; Elected to various Upper and Lower House offices representing New Haven, 1760s, 1770s; Judge of the Superior Court of Connecticut, 1766-1789; Elected to Continental Congress, 1774-81, 1783-84; Distinguished member of the Constitutional Convention, 1787; Elected US Senator for Connecticut, 1791-93. 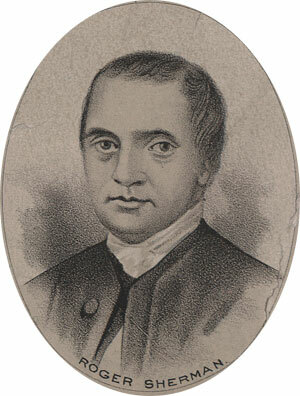 Roger Sherman was born at Newton, near Boston, on April 19, 1721. When he was two his father took the family to what was then a frontier town, Stoughton. His education was very limited. He had access to his fathers library, a good one by the standards of the day, and when Roger was about thirteen years old the town built a "grammar school" which he attended for a time. Stoughton was also fortunate to have a parish Minister by the name of Rev. Samuel Danbar, who was trained at Harvard. Danbar helped young Roger acquire some facility with mathematics, sciences, literature, and philosophy. His first experience with an official office came in 1743 when he was appointed surveyor of New Haven County. A few years later he was commissioned by neighbor to consult a lawyer at the county seat regarding a petition before the court. The lawyer asked if he could examine Sherman's notes and reading them, urged Sherman to set up for the practice of law. At age twenty one he engaged in both civic and religious affairs in New Milford Connecticut, where he and his brother also opened the towns first store. He served as the town clerk there and was also chosen to lobby on behalf of the town at the provincial assembly. Since New Milford did not have a newspaper and reading material was hard to come by, Sherman wrote and published a very popular Almanac each year from 1750 to 1761. Sherman was accepted to the Bar of Litchfield in 1754, and to represent New Milford in the General Assembly the following year. He was appointed justice of the peace, and four years later justice of the Superior Court of Connecticut. By the age of 40, he had become a very successful landowner and businessman while integrating himself into the social and political fabric of New England. He was appointed commissary to the Connecticut Troops at the start of the Revolutionary war; this was experience that he put to great use when he was elected to the Continental Congress in 1774. Sherman was a very active and much respected delegate to the congress. He served and numerous committees, including the committee to draft the Declaration of Independence. He served all through the war for Independence. As active as he was in Congress, he simultaneously fulfilled his other offices. In 1776 these efforts began to take their toll on his health. Thus, he appealed to then governor Trumbull to relieve him of some of his state duties while he remained on in Congress through 1781. He left the office in 1781, then returned in 1783 and 84, where he served on the committee forming the Articles of Confederation. His interests in the strength of the federation carried him to the Constitutional Convention in 1787 where he was one of the most vocal and persistent members. Madison's notes on the convention credit him with one hundred and thirty-eight speeches. His tiny state of Connecticut was in a precarious position, and Sherman ardently defended the rights of the smaller states. Many of the most notable figures of the revolution, Adams, Jefferson, Madison, admitted a deep admiration for Roger Sherman and his work. From their notes Sherman appears as a picture of New England pragmatism: stern, taciturn, spare with his words and very direct in his speech, but never hesitating to stand-and stand again-for his principles. In July of 1793, Roger Sherman died of typhoid at the age of 72. At the time he served as US Senator from Connecticut under the new constitution that he had helped to build; in the new nation, that he had spent most of his life defending and defining.